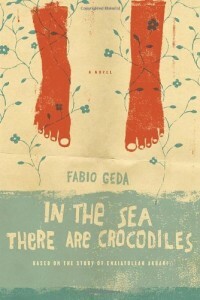 FABIO GEDA is an Italian novelist who writes for several Italian magazines and newspapers. This is his first book to be translated into English. Howard Curtis is a London-based translator of Italian and French texts, for which he has won numerous awards. Born in Afghanistan and smuggled out by his mother, he left in Pakistan at age ten to fend for himself, Enaiat manages to make his way to Italy and obtains status as a political refugee. This should be a sad and serious tale, but the story telling comes alive and provides a humorous and winning look on life. Yes, his harsh life is harrowing, but as a young boy, Enaiat finds that he can survive and even thrive through the hardship. I was cheering for him the whole time! The author did a wonderful job translating this boy’s story without losing the voice of the subject. I really thought the interspersed translations were direct and inspiring. Just when you think your life is bad, there is a tale that comes out to teach an important lesson. This giveaway is sponsored by DoubleDay and TWO copies are available. This one is on my “books to watch” list. Sounds like one I’d be interested in reading. Enaiat’s story sounds riveting. It sounds like a great read. What a story. I would love to read this one. Daily entry 9/9/11. Thank you!